You may remember that Adobe “end of life’ed” Adobe Acrobat 9 more than a year ago. This does not mean that Acrobat 9 does not work anymore, it means that you will not get any security updates for new security threats. When you install a new version of Acrobat, you always end up with a x.0.0 version (e.g. 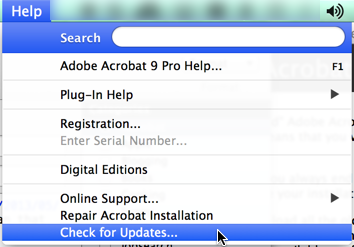 9.0.0 for Acrobat 9), this means that you need to first upgrade your installation to the latest available version. Up until recently, it was no problem to download all the old Acrobat 9 updates, but Adobe – because Acrobat 9 and older are no longer supported – removed those update links from it’s update web pages for Mac and Windows. The only update versions available are for Acrobat X and XI. How does one update an Acrobat 9 version that needed to be re-installed? According to what I’ve heard from Adobe, it should still be possible to use the “Check for Updates” function in Acrobat’s Help menu, but the last time I’ve had to re-install Acrobat 9, that was not the case. If you need to access updates for older (non-supported) versions of Adobe Acrobat, these are still available, but accessing them is a bit more complex now: Adobe has a FTP server that holds all old updates. The problem is that it does not have the release notes that go with these updates, this means that it may not be obvious which version of Acrobat is required for which update. We also don’t know what exactly was fixed in each update, but as long as we start out with a brand new Acrobat 9.0.0 system (e.g. installed from your original installation disk, or via the download page http://helpx.adobe.com/acrobat/kb/acrobat-8-9-product-downloads.html), and then install every available update in the correct order (e.g. 9.0.1 first, followed by 9.0.2 and so on), we will end up with a working system. Your browser should be able to deal with FTP links, just like it does with HTML links. However, navigating the directory hierarchy is more like navigating a folder structure on your computer than selecting links on a web page. You can also find updates for older versions of Acrobat on this FTP server. This entry was posted in Acrobat. Bookmark the permalink. 87 Responses to Where are my Adobe Acrobat 9 Updates??? Thank you for posting this! I was going up a wall after reinstalling Acrobat 9.0 Pro and couldn’t find the update files anywhere. Adobe went out of their way to hide them and the links on the website no longer work. I was going nuts over this too. Beats the hell out of me why legitimate users are made to jump through hoops etc, when if I was so minded (i’m NOT), I could FAR easier go and torrent a cracked Acrobat XI!! If this is the way major software publishers treat users who pay for their sware then they are sewing seeds for their own demise. Anyway, enough moaning! Thanks again – you are a star! Makes it easier to get them. Thanks! Great Info!! Just a pain to install ALL those updates. Thank you so much for sharing these helpful informations! Thank you very, very much. I am going to combine this information with the information that I found at the following link: http://helpx.adobe.com/acrobat/kb/update-patch-acrobat-reader-7.html. With all of this information, I’m now confident that I’ll be able to properly update my Acrobat 9.0. If I can, I’ll send an update later to let you know how it goes. Nevermind what I said, I obviously had a brain fart… Thank you my friend!! Do I just launch each of these files in some (or any) sequence; and then move on to the next group in 9.12? As someone posted above, Adobe sure doesn’t treat paying customers well and I bought my Acrobat pro 9 legitimately. I don’t have such an AIP in my Adobe subfolder so found this post on creating and running patches … seems like an insane amount of work. I am so mad at Adobe; I just ordered Lightroom and think I will return the program and use some other solution. I also plan to call Adobe and let them know they have shot themselves in the foot and have lost at least part of my current and future business. As I said I hope the update process is NOT as challenging and I have a misunderstanding. Thanks again for the article and for anyone who can help me out here. Thanks for the guidance. I had the dreaded issue of Acrobat 9 Pro asking for my user password every time I open it, I know it was because this was a reinstall of 9.0.0 on a newer version of Mac OS, so I was going to do the whole patching one by one, but here is what worked for me the fastest: 9.0.0 > 9.1.0 > 9.1.1 > 9.1.2 > 9.1.3 > 9.2.0, at this point, the startup password request error was gone, and best of all, the option to “Check for updates…” finally appeared on the Help menu. When you select it, it goes all the way up to 9.5.5 on its own from that point forward, it works at least for now (Dec 2014), the download of course can take a while, but it’s all automatic. This is a PITA. I wish Corel had a decent pdf equivalent. After all, Draw is better than Illustrator IMHO, so why can’t they make that with all the other things? I assume in each folder are updates for various languages, it would be nice if article specified which extension is for what language. When you use the link that I posted as an update, you will get a bit more information about which languages are supported. As far as I know, the _me is for the “Middle Eastern” version of Acrobat. Hi everybody, I am re-installing Acrobat 9 for Mac. Does someone out there know, what the difference is between those three versions? If I unzip/open the files, an *.app file shows up, but they all are different. Marko, the different versions are for different language versions. “gef” very likely stands for “German/English/French”, and “all” is very likely for all versions. Sometimes there is a “_me” version for “Middle Eastern”. The dmg vs .app.zip files are just different formats. One is a Mac disk image, the other one a ZIP file. Kurt’s post above was great and I was able to go from 9.1 to 9.4.5 in a short time using patch files from Adobe’s site. 9.0.0 > 9.1.0 > 9.1.2 > 9.2.0 > 9.3.0 > 9.3.2 > 9.3.3 > 9.4.0 > 9.4.2 > 9.4.5. Note there some gaps that I guess are security only and Adobe says to skip them because I guess they are included in the “quarterly” updates. But the list of files evaporates after 9.4.5. I’m still looking for 9.4.6, 9.5.0, 9.5.1, 9.5.2, 9.5.3 and 9.5.5. Guess I’ll live with 9.4.5. Thanks all for the useful info. With it, I managed to re-install Acrobat 9.5.5, this time on Windows 8.1. It’s a lot of work though and Adobe could really come up with a more practical way to do the updates and protect our investment in Adobe software. Jan…just curious…how did you get to 9.5.5? The patch files I found on Adobe’s site stopped at 9.4.5. I didn’t want to go to any of the “pirate” sites to get the rest because…well…I didn’t. But interesting you found it difficult. My biggest hurdle was getting the product key. It was originally a download and the product key was sent via e-mail (I think back in 2009). The original machine was Vista and I used Microsoft mail as my mail client. Somehow something happened in the past 6 years where most of the 2009 e-mails went missing. I even yanked my old XP machine out of the basement thinking maybe the e-mail went to that one. But anyway, I finally stumbled across a CNET free “keyfinder” and that produced the key in about 2 seconds (my old MS Office Suite key was there also). From there, once I found this thread and better understood the “building” process, each necessary step only took 2 minutes or so. Now to close this out…today my new machine started acting goofy. After a restart, I had a prompt that Acrobat needed to install updates! I thought the product had been sent to the boneyard but I guess they still monitor the products and patch up to the last version they produced. I am now full on 9.5.5! Last question…I’m running *.1 also. I find it’s impossible to close the program if you hit that “Help” “About Adobe Acrobat” short of Task manager. How about you? Thanks for heading me in the right direction. I subsequently found Release Notes for the updates available here: https://helpx.adobe.com/acrobat/release-note/release-notes-acrobat-reader.html. I am getting an error message from the Windows Installer “The upgrade patch cannot be installed by the Windows installer service because the program to be upgraded may be missing, or the update patch may update a different version of the program. Verify the program to be upgraded exists on your computer and that you have the correct upgrade patch”. My OS is Windows 7 Home Premium with Service Pack 1. Ac9Ex3DUpd.msi which I get an error message of “No qualifying products found to apply this update” but that seems to be for Pro and I cannot find a different updater. Oh, and Adobe does not appear in my “programs” list but the app does launch fine with the shortcut. Lloyd, make sure that you apply the updates in the correct order. the “Ex3” update is very likely for Acrobat Pro Extended, which you don’t have and therefore the update is displaying the error. It’s actually not “Pro”, it’s “Pro Extended” that has the “other” installer. Standard and Pro are both getting updated with the installer in the first column. Unfortunately, sometimes the installed application gets corrupt (as far as the installer is concerned), and your only way out of this is to uninstall Acrobat from your system and start over. I would actually recommend to do one more thing and run Adobe’s Cleaner application (which you can download from here: http://labs.adobe.com/downloads/acrobatcleaner.html). If you use this, make sure that you unregister your application (either via the Help menu entry or during the uninstall process), and that you save any custom item that was installed for Acrobat (e.g. stamps, scripts, plug-ins, …). Karl, when I tried using the links from the knowledgebase article or the FTP server last week they didn’t work. I see they do now. Maybe they were just having a bad day. But anyway, Adobe completed the process from 9.4.5 to 9.5.5 for me! Was surprised that they are still checking. One of my gripes with Adobe is that they “push” upgrades in the background without asking. In my case I have measured internet service. If I can control the time of day it’s not a problem because they provide a large allowance 2am-8am for such things. Works for most things like Windows etc. where the upgrade settings can be set. Not so for Adobe. I’m unsing a Mac with OSX 10.6.8 und just successfully reinstalled my Acrobar 9.0. I found this here very helpful so far. But I cannot update. When I try to copy the update files from the FTP server I get a error message 36 when I copy to my desktop. When I copy to the Acrobat 9 Pro Folder the copy process gets stuck. Any advise what to do out there? The problem seems to be resolved now. All the above has helped a great deal. For my MAC with OSX 10.6.8 the updater started to work when I got through the update 9.3. So that saved a lot of time. I just hope the installation process for 9.5.5 that is still running doesn’t get stuck. Thanks for the direction. Took me a while to find this article but you all were very helpful. I am up and running now in Win 8.1 with Adobe 9.5.5. Thanks! Bryan, keep in mind that Acrobat 9 was never supported on Windows 8.1, so whatever strange behavior you will encounter, that may be the reason. Set your computer date to a date prior to June 1st, 2013 and do “Check for updates”… Install any updates found and repeat the steps until there is no more updates available (you’ll have to reboot a few times between updates). After that, you can reset the computer date to current. I’ve done it many times and it still works now (July 2015). This is much easier than trying to download and applying the patches one by one manually. WONDERFUL help available here!!! Thank you so much. I found that 9.0.0 (under WinXP64) would not “auto update”. However, after doing a “manual” update (tedious step by step via the ftp site) to 9.2.0, it was able to “auto update” to 9.5.5. 1) Once the auto update starts in 9.2.0, it will require quite some time for its internal processing to dload the (many) patches/updates. If you click “check for updates”, it my respond with “already running” or something to that affect … let it run. just fresh installed (Adobe CS4 and) Acrobat 9.0.0 on a new machine. have just realised that its not working and needs updating. and now find out that I just stumbled into an adobe brick wall. Looks like that link to the adobe ftp site has stopped working in the last week…. is there anywhere else to get those Mac 9.x updates??? HELP. It’s a shame this thread is so necessary. Thanks to the O.P., “J”, DrO, & most of all, Kurt! Even though I was signed into Adobe, selecting the links in the KB article brought me to a generic trial software page that did not offer the 9.0 updates. Following the KB article for the Quarterly updates, Kurt’s method worked for me on Pro 9. Once I upgraded to 9.2.0, check for updates did the rest of the updates in 1 shot. Great advice, Tan Vu! Marvelous. Tan Vu’s advice on changing the computer clock prior to June 1, 2013 mostly worked for me. After changing the clock the update worked and did a big update (from 9.0 to 9.2 maybe??). But then, when trying to do the following updates, I kept getting a “connect to server” error and “try again later” message. After several tries on and off through the day, I gave up and reset my clock to the correct date. After resetting the date, I tried updating again. This time it connected to the server and updated from 9.2 to 9.5.5. In my case, I could only update from 9.0 to 9.2 using the “date before June 1, 2013” trick. The subsequent updates were acquired with the current date in Sep 2015. BTW, I was updating Acrobat Pro 9 on a Windows 7 system. Thank you so much for this! What a pain, but this is so very helpful. BTW, I found some of the later updates stored on my old computer. Interestingly though, the stored updates only went through 9.5.4, i.e., didn’t include 9.5.5! Kurt’s message was especially helpful. And I’m really glad that I had ftp software to download all of the ftp directories with a single drag and drop! Thank you Karl and thank you Victor D. for excellent instructions on updating Acrobat 9.0, in my case, for Mac. Victor, I have had the same problem with Acrobat, with it ultimately requiring a complete fresh reinstall of CS4, and this means archaeology work to get those patches. Eh, I couldn’t get the updates to work on Acrobat 9. I think it’s time to bite the bullet and submit to CC. ouch. Been struggling with this for 5 months now and had a few minutes to kill and revisited this problem. I just tried Tan Vu’s fix; he’s the man! 1) Set your clock back to March 2013 as per Tan Vu’s instructions. 3) Launch Acrobat 9 and check for updates. Install! Joe, Acrobat 9 is not supported on Windows 10, so there is no guarantee that you won’t run into problems eventually. It’s been working fine for months now. I have tried the link in this article http://helpx.adobe.com/acrobat/kb/update-patch-acrobat-reader-7.html and it is taking me to the adobe enterprise site to log in. I keep getting a message to update adobe pro 9.0 but on the next page it only goes up to pro 8.0 to select as your current product which of course my serial number is for 9.0 not 8.0. Any assistance is greatly appreciated. I am running Windows 10. Debra, unfortunately this link is (at least currently) not working anymore. Let’s hope that Adobe fixes this soon. 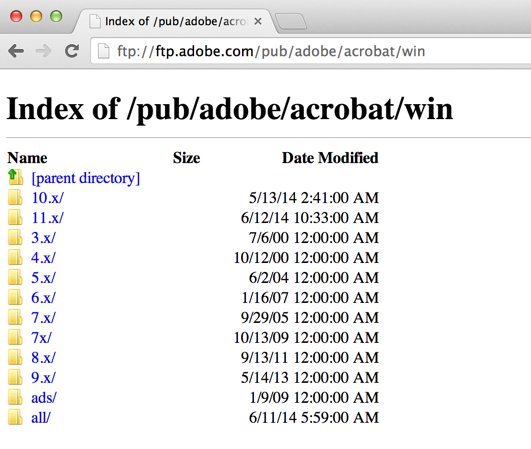 Thanks very much for the ftp link to Acrobat 9 (and Adobe) downloads. Greatly simplified the chore for me ! Joe Sizlack’s instructions work at least as far as 9.2. Karl the reason Adobe says Windows 10 is not supported is because Adobe has not officially tested it yet. It does work quite well with 10. Bob, it’s not that is was not officially tested “yet”, it will never be tested. And therefore it’s not supported. Actually, Acrobat 9 is no longer supported at all (that’s why we are having this discussion about where to find the updates): Adobe has ended support for Acrobat 9 back in 2013. If you go back to my comment where I talk about Acrobat 9 and Windows 10, you’ll find that I said “so there is no guarantee that you won’t run into problems eventually” – and that is still true. Because it was never tested, we don’t know what lurks below the surface. And I know for sure that there are problems with Acrobat 9 on the last two releases of Mac OS X, and I would expect a similar situation on the Windows side. The operating system has moved forward, and the application was not adapted to keep up with it, that is a pretty good indicator for potential trouble (and I say this as a software engineer with a lot of experience with brining applications up to date with newer versions of operating systems). You may not have encountered any problems, but that does not mean that there are none. Thank you for the article and commenters for their responses. You helped me a lot! _me in a filename stays for Middle East as described by others above. I just want to mention, for those who do not know it (as didn’t I) T1, T2, T3 and T4 stays for Tiers identifying installer language (I have not found any info on Acrobat Pro 9, but there is some description valid for Reader 10, which worked for me: https://helpx.adobe.com/acrobat/kb/update-patch-acrobat-reader-10.html. I followed the sequence mentioned above and a Acrobat updated it self to 9.5.5 automatically once 9.5.1 update was installed. Running Acrobat Pro on Win 10 x64. I reinstalled Adobe Acrobat 9 Pro version 9 as part of a CS4 installation. This works with El Capitan!! But they would not update the installed version. A notice informed me that I think that the language pack was different to the update. I have no idea how to deal with this. I can download the archived version AA9P but it may not install into CS4. I have found the original AA9P 9.0 works very well with El Capitan. It is Even able to control my old scanner. I am just wondering if I should leave it as is and use the fre Acrobat Reader DC for opening unknown source PDFs. I was able to update Photoshop. And even more surprising Illustrator appears to be working. While I am waiting for moderation to clear my posts I have discovered that on the initial set up window I have the choice of the English ( Internation) or the English (US) Language Pack. I am guessing the updates are the (US) version and I have installed the (Internations) version and this is why they won’t update my installation. David, as far as I can tell (again, Adobe unfortunately took down the page that had more information), there are two different updates available for the 9.1 Mac version (based on your previous comment, it looks like you are running this on a Mac): AroProUpd910_all.dmg and AcroProUpd910_gef.dmg. The second one should be for German, English and French, the first one should work for all (or all other languages). If that’s not the case, then unfortunately, I am out of ideas. BTW: Acrobat 9 does definitely not work without problems on El Capitan, and neither does Acrobat X. Look for example at the “Bookmarks” pane when a document that contains bookmarks is open. Thank you for your reply. I do not expect much from CS4. I can edit photos in Photoshop, do simple layout in Illustrator, open old Indesign files and Acrobat still drives my scanner makes PDFs and does OCR. I am pretty satisfied with that considering that CS4 had problems with a number of OS updates. I think Adobe’s strategy was to push people to subscription software. I will try the other file in the 9.1 folder. I will burn the updates to DVD for future experiments. For my minimal Acrobat 9 use is there any advantage in trying to update it as it is not longer being updated. David, I would update (and I actually did on my installation of Acrobat 9), especially when you are trying to run it on a newer operating system: The updates add support for newer operating system versions than what Acrobat 9.0.0 supported. Karl, thank you. The ‘all’ version updated and then I managed to update Acrobat. That was on an older iMac (2010) with El Capitan. So all up and running. On a new iMac 2016 do I have to download a version of Java before CS4 will work. I am very grateful for being able to continue keep CS4 running even if not perfect! I just found a note that Apple will not be supporting its Java 6 after El Capitan so I will not install Cs4 / Acobate 9 on the new Mac. The older Mac can cover me for a long time as I begin to work out the next step. Thank you so much for helping me get Acrobat updated. It “appears” that Adobe is trying to “force” the user base to switch over the the WIN-10-subscription model, which for small screen mellinneals I understand, for us boomers who still use full size desk tops after 2 cataract operations not so much. For basic PDF document editing (basic document assembly, OCR, crop & resize, security locking and electronic signature ) what does this community like as an alternative to Adobe ? I have a new macbook pro with El Capitan. I installed Acrobat Pro 9 using my disc. But when I try to run the first patch and get to “Please choose the copy of Adobe Acrobat Pro to update”, I can’t select anything. Everything is greyed out. Any suggestions? Sally, Acrobat 9 is not supported on and will not run correctly on El Capitan. Your options are basically to upgrade to the latest version of Acrobat, or to run Acrobat 9 in a virtual machine using an earlier version of Mac OS X on top of El Capitan. Thank you Karl. At least I know the problem and can stop searching for a solution! Thanks. Ran into the same problem re: reinstallation of Acrobat 9 Pro on 6/30/16. You saved my bacon. While reading through about 3/4 +/- of the posts I really think I as close to being a nu bee as you can get. First, I am using windows Vista home premium and Adobe acrobat 9.0.0. This works well under certain conditions but I tried to get upgrade(s) and I get a message, “there are no updates available”. After reading the posts I now know there are. After reading the posts the water got pretty muddy for me and left me very apprehensive to do any of the actions posted. I may figure it out in time. Also I would like any input that may help with the following, when I try to open a .pdt file on the internet using IE 9.0.51 OR Firefox 48.0 it takes an extremely long time to open the document it it’s 10 pages or 1100 pages. Any input would be helpful. Thanks in advance. Rich, unfortunately I don’t know what is causing this. As the first step in trying to figure out what’s going on, I would repair the Acrobat installation. You can find the “Repair” function in Acrobat for Windows’ Help menu. After you install 9.2 you can simply click check for updates to get the rest. Tan Vu, who posted here on July 30, 2015, suggested setting back the computer date to sometime prior to June 1st, 2013 and then using the software to ‘check for updates’. After each update, the system will need to restart. Afterwards, check for updates again and keep doing this until there are no more updates. This works very well, is easy to do, and does not involve spending time trying to do the ftp/downloads you originally suggested. A couple of other posters mentioned that if you hit a snag and are not able to do all of the updates, do a cold boot (turn your computer off & then back on again) rather than letting the software do a warm boot (restart your system). And, if you still are unable to get the rest of the updates, set the clock back to the correct date and try again. It may be worth editing your info on this page so that others do not have to spend the time reading all of the comments to eventually find the answer that works for them… just a thought. Peg, thanks for the update. As usual with blog posts, it’s always important to read the comments as well 🙂 Thanks. Yeah, this still works on August 9, 2017! Many Thanks to Kurt, the author of this very useful and informative tutorial, and to KHKonsulting LLC too! Congratulations to Karl Heinz Kremer for his valuable inputs and to “J”, the first to mention the right shorter sequence to udpate faster. The same for me as Victor D but for a fresh install on a Windows machine: after manual sequence 9.1, 9.1.2 then 9.2 Acrobat automatically updated to 9.5.5 in one (long) shot quickly after reboot. Cheers from France to all! On a Mac (on El Capitan, at any rate), some of the updates will not appear via FTP in finder; go to ftp://ftp.adobe.com/pub/adobe/acrobat/mac/9.x in Chrome or another browser that doesn’t redirect to Mac’s finder system and you should be able to get them all. I found I could not skip any and turning back the clock did not work, but that once updated to 9.2 the built-in updater (“Check for Updates” in the help menu) in Acrobat will begin working again. Thanks to everyone who contributed to this discussion, and KHK for getting it started. I have an update for Mac Users who want to update to Acrobat Pro 9.5.5. Sorry, forget that last comment. The links don’t work. ?